In today’s fast paced and competitive society, many people want things to happen as fast as possible. We want to be instantly approved if we apply for something so we can move on to the next order of business in our hectic schedule. 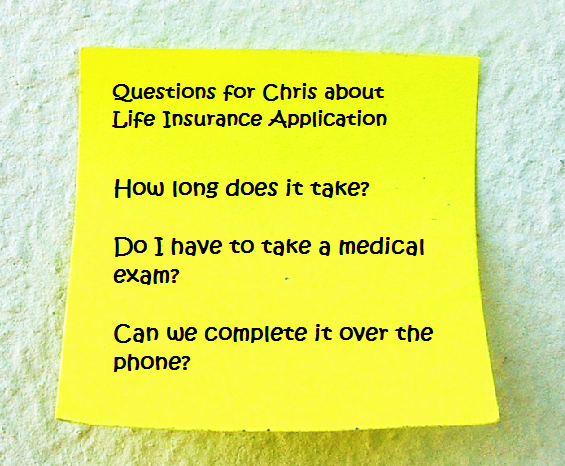 Although instant approval works for many different items, the life insurance application process is not usually one of them. The first thing to mention is that there is ‘NO COST’ to you to complete and submit an application. The only exception to this is if you are over 60 and haven’t visited a doctor in many years. In this case, you’ll have to go get a checkup before any company will approve you. You will first have to decide on what type of life insurance policy you need such as choosing between term, whole life or universal life insurance. Then you will have to decide on the amounts of coverage and how much you can afford to budget. 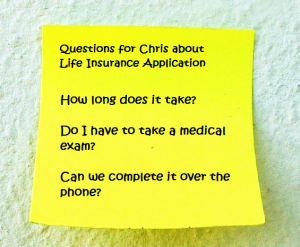 After you have made your decision and done your research online, you will then have to fill out an application through an agent, such as myself, or directly with a life insurance company. This can be accomplished with your insurance agent in a variety of manners such as online, by phone or in person, if you are in the San Diego area. A life insurance policy is also a contract between you and the insurance company. When you get approved by the company, then you, as the insured, will have to sign for the contract/policy you are sent. This may be either done through ‘snail mail’ or for some policies, may also be done electronically through an email, fax or some other format. The waiting period that occurs when you submit a life insurance application varies from company to company, and also on the qualification requirements. The qualification requirements depend on your age, the amount of coverage applied for, and the type of medical exam or interview you are given. If you apply for a “no exam” type of policy, not requiring a physical exam, approval will generally come in just 7-10 days. It will take longer with an exam type of policy, but is generally less expensive. The medical exam has different formats for different type of life insurance policies and also varies between life insurance companies. The medical exam could take the form of a questionnaire, a telephone interview/questionnaire, or an actual medical examination with a doctor. The doctor might be your own doctor or it could be one specifically chosen and used by the life insurance company, usually completed by a “paramedical” examiner from a large exam company such as Exam One or Portamedic. The insurance company will generally advise you beforehand about how they want the exam done, either verbally or in writing. Alternatively, you may receive a call from the doctor’s office which is used in your locale by the life insurance company with an appointment. 4. The time it takes to send you the policy, have it signed by you and returned with the first premium payment. During this waiting period, you will not be covered for life insurance automatically as you have to be approved by the insurance company first. You may ask your agent to be covered by a temporary insurance agreement, which actually would cover you while you wait for an official offer, if you pay the first month’s payment at the time of application. Generally speaking, many companies require that the first premium be paid before coverage starts and your life insurance policy takes effect. Although it might sound like an onerous and drawn out process, it’s not. Usually, the majority of policies can be in force and you can be provided with life insurance coverage from between 7-14 days – not much time at all. However, if medical records are ordered, it may 3 to 6 weeks to secure an approval. If you have a current life insurance policy and want to cancel it to buy another policy with cheaper premiums with another company, don’t cancel your current policy until your replacement policy is in force. If you cancel your policy before your new policy application is approved, there may be a gap of time where you have no coverage. This leaves you exposed. Also, when you do cancel any policy by phone or mail, it’s also wise to follow this up in writing. No Exam/Interview Only – Occurs when you do not have to actually see a doctor and the interview process occurs through a questionnaire or phone interview. The time it takes from completing and submitting the application to your receiving the policy and you have signed for it, will take roughly between 7-10 days. Medical Examination (No medical records required) – Occurs when you are required to take a medical examination but the life insurance company does not require any additional medical records from your own doctor. The time it takes from completing and submitting the application to when you are issued a policy and signed for it will take roughly 14 days. You should note that Interview Only policies usually cost more money than one where a medical exam is required. The reason is that if the insurance company has more information, the less risk they take assume so they will charge you less. Simply call us at 877-996-9383 or get started by completing our quick quote form on the right.